Like a classic automobile, your body is a system, all parts working together in harmony when it’s at its best. And like a car, your body needs quality maintenance of all those parts in order to operate at peak efficiency.compound exercises You could address one issue at a time – your quadriceps, then your knees, then your biceps – but just as when you take a car in for one thing at a time, it’s less effective and wastes time if it becomes a habit. Compound exercises address many body parts all at the same time, from large muscle groups to cardiovascular health. By treating your body as a whole system instead of a collection of parts, it efficiently addresses all your goals quickly and efficiently. Often, people train with only isolation exercises – curls, extensions, or lift machine exercises designed to target single muscles or small muscle groups involving a single joint system. Compound exercises, on the other hand, target much larger areas. Squats, for instance, use muscles from the hip, knee, and ankle groups, essentially your entire leg and the glutes. Isolation exercises are fine for targeting a single area, and they are an important part of any training regimen. The problem arises when they are overused, addressing one goal at a time instead of looking at your goals as a whole. Compound exercises spread work out over a larger number of muscles, and they should form the bulk of any workout. Compound training requires more overall work for your muscles. This means your body burns more energy faster, giving you a higher caloric burn rate overall (for better weight loss) than isolation exercises do. In one study, compound and isolation exercises were compared for relative metabolic cost. The researchers found that isolation exercises burned an average of 6.8 calories per minute, compared to compound exercise’s burn of 11.5 calories per minute—nearly 60% more. In addition, working more muscles at once causes faster muscle density build. When you’re working more muscle, you can lift much more overall, and while those overload benefits are spread out across a much larger area, the net benefit is much larger than with isolation exercises. Because compound exercises work a much larger part of your body, it makes sense that they would have an effect on other systems. Cardio and bone mass both benefit from compound exercise. Multi-joint exercises, for instance, tend to increase spinal bone mass. This decreases your risk of osteoporosis and fractures in old age. Similarly, compound training puts pressure on your cardiovascular system. While lifting and muscle-strengthening exercise is anaerobic, once your set is over your body must work overtime to get blood to your muscles and remove waste products. Just as with aerobics, this raises your heart rate and builds heart muscle strength. For this to be most advantageous, your compound exercise regimen must include short rest breaks to provide those resting cardiovascular opportunities. Last, but not least important, compound exercises are more true to life, using your muscles the same way you normally use them every day. When you carry in groceries, you’re not just using your arm muscles; you’re putting your back and legs into it as well. Walking up stairs involves not just your knees but also your whole leg, your glutes, and often your back muscles. 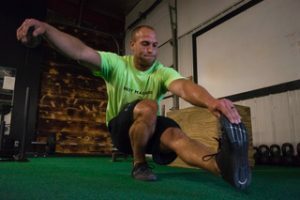 By training compound exercises, you strengthen entire systems, ensuring those isolated strong spots don’t carry too much of the load and allow your other muscles to get lazy, and you make those everyday tasks easier. Even better, compound training workouts give you more bang for your time’s buck. By combining as many muscle groups as possible while also taking advantage of the cardio-building benefits, you can create a simple, fast training regimen that addresses all your physical goals in two or three sessions per week. A personal trainer (like Body Masters in Omaha) can help you develop the best possible regimen for your goals, freeing up your exercise time and ensuring you get great results quickly. If you’re ready to work out smarter, give Body Masters a call. You won’t regret it.